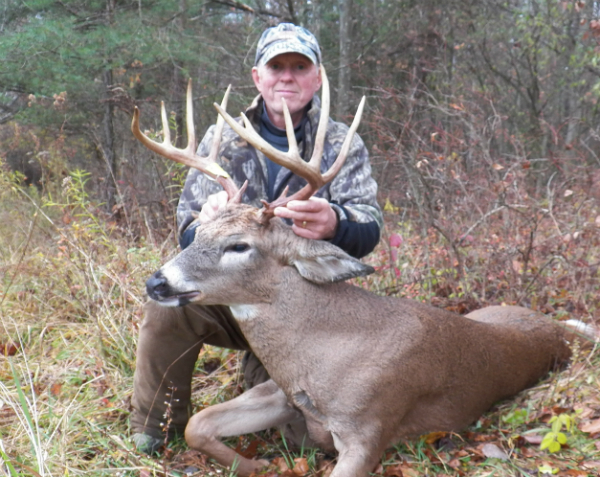 Photographing your deer harvest should be an important part of your deer harvest experience. Here are some basics for photographing your deer after the harvest. You would think in this age of small digital cameras and cell phone cameras it would be easy for hunters to get a quality photo of their trophy buck. Maybe it's the excitement of the moment or maybe you forgot to bring along your camera, whatever the reason many hunters just fail to capture the hunting memory of the day on film. Pick a natural background. Taking a picture at the spot of the harvest is always best when possible. Trees and bushes, NOT 4-wheelers, tractors, messy garages or pickup beds. If you have to wait until you get the buck home pick a spot in the yard that looks natural. Try to eliminate any unnatural objects from the background. Make your buck look presentable by cleaning up excess blood, tucking in the tongue and rubbing back any roughed up hair on the deer. Taking the photo before gutting the deer helps cut down on blood and eliminates having to manuvuer around the gut pile. Prop the deer up by tucking the legs underneath, then hold the bucks head up by his antlers, concentrating on showing off the best features of his headgear. Sit or kneel behind the buck's head as you hold it making sure not to cover your face. Positioning yourself behind the buck's head and taking a shot of the entire deer will make it easier to crop photos later to fit almost any type of framing. Crop your photos to take out unwanted background or subjects other than the deer and the hunter. Make sure the subjects are centered in the photo and balanced top and bottom, side to side. Pay attention to things like the hunter's head being cut off in the picture. Taking plenty of photos in various positons when photographing your deer ensures that you will get a quality shot of you and your buck, maybe even a few good shots. If you take shots with your weapon in the photo be sure to either hold it in your hand upright or lay it across the deer's body and make sure the muzzle is pointed away from you! Laying your gun across the antlers does not make a good photo. Lighting is very important. On sunny days place the sun at your back and pay close attention to any shadows that might hide portions of you or the deer. When taking a pic at dark or in low light use a flash. Use a good high megapixel digital camera for best results. Try to buy a camera with a self timer built in so you can take picture when you're alone in the field with no one to take photos for you. Check the quality of the images in the photos after each photo taken to make sure the photo is clear and not blurry. Nothing worse than taking a bunch of pics only to find out when you get home and upload them to your computer that they are all fuzzy. Taking a little time after your harvest to capture your trophy on film makes for good memories to share with friends and family. Plus you never no when that photo might be published on some website for your fellow hunters to enjoy.